A visit to the theme park is a summer time staple here in the US and for many foreign and domestic travelers they are a must see destination as well. But the theme park craze isn’t just an American pastime, instead this love of rides, games, food and fun has become an international hit spanning the world. If you’re thinking about adding a stop at an incredible theme park to your next travel itinerary take a look at these 15 amazing theme parks from around the world. Officially known as Universal’s Islands of Adventure, this Florida theme park is centered around the love and thrill in the journey of exploration. With its slogan “Live the Adventure” the park offers visitors a look into 6 distinctly themed islands that all focus on adventure. From the main port of the park visitors can travel to the Marvel Super Hero Island, The Wizarding World of Harry Potter, Toon Lagoon, Jurassic Park, Seuss Landing and the Lost Continent. With the addition of the Harry Potter themed island in 2010 the park upped its yearly attendance and gave fans from across the world a chance to explore the world of the witches and wizards from the book and movie franchise. Each island also features its own set of rides, coasters, restaurants and gift shops that follow the islands theme. 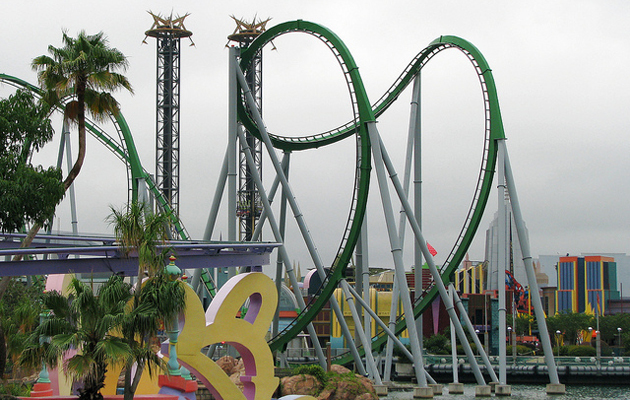 With the Incredible Hulk roller coaster on the Marvel Island and the Pteranodon Flyers coaster in Jurassic park, there are plenty of thrills and chills in each different area for visitors to explore. Islands of Adventure nabs a spot on our to list for its ingenuity, sense of exploration and attention to detail.